What about the water mark, It will continue to show? For free version they'll be watermark on 720p60 and 1080 formats. Paid version won't have any watermark. CraigS I ask this because we can not paid anymore for the program, gameshow is no longer for sale, as official web site said.! Vikingo King It's true that sales has ended. That means no way for users to move from the free to the paid, fully watermark removed version. Unfortunately there was no advance notice for users to make that end of sales purchase. I will inquire about that but I don't expect a change in that policy. CraigS Noted brother, thanks for the support. Looks like we need go buy another program. That sad. Vikingo King We do have Wirecast which is Gameshow's "big sibling" (or may parent). CraigS Whit Wirecast can I stream on Twitch and Youtube? It is this progrm better than Xsplit Gamecaster for gameplay streaming? Vikingo King Twitch, YouTube, Twitter, Facebook and many others. Vikingo King and anything not on the list you can enter in your address and stream key manually. CraigS wow, that is excellent support, I will try free 30 days trial to see if it is what I need, looks like this is a powerful tool. But it makes me curious why I never heard of this program, first look , looking great. CraigS I try the wirecast and it is the same that gameshow, Why do I need to paid now $900 for wirecast vs $30 usd as gameshow? I feel that this is not fair for those who loved gameshow. Vikingo King One of the big differences is the number of destination. Another is that if you have the computer resources and bandwidth you can stream to multiple destinations at the same time. Implementing all those destination took lots of development work. The integration with Facebook runs very deep with the ability to stream to Pages and Groups in addition to Profiles. We're also implementing Facebook Live Polling, Crossposting and Advertising. There 5 Master Layers instead of 3. This means you can use a dedicated Master Layer for audio, for example, and still have 4 layers left. Also ISO recording so you can record your camera sources clean separately in addition to the stream recording. Direct PTZ camera support. This can be important for people doing sports for example. You can setup PTZ cameras and feed them to Wirecast over LAN. People doing High School or College sports use this. 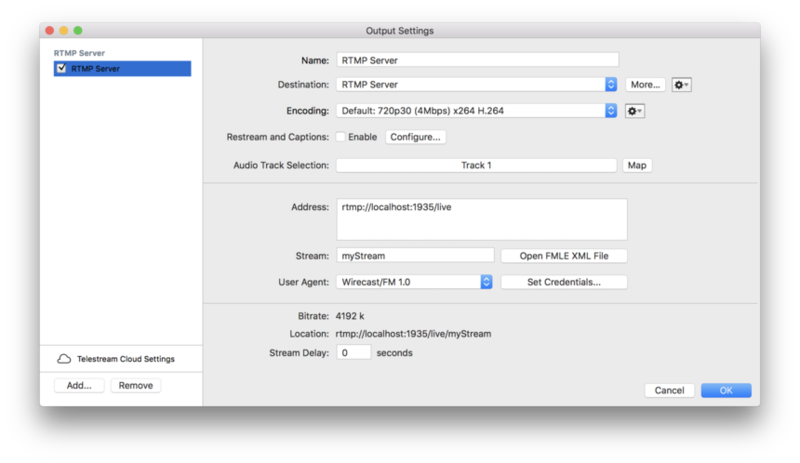 Streams as source (Web Stream) support which uses the PTZ input area to take in streams from servers that allow it. For example, someone remotely streams to a Wowza server and then you can use the stream from the Wowza server as a camera source. There's also Titler Live Express which has some very advanced titler features not found in Gameshow. It comes with Wirecast and is normally sold separately which costs $99. And this includes Facebook Comments integration so you can select and display comments live as lower thirds while you stream. CraigS again many thanks for the prompt response to my questions, I'm really in love with gameshow and would like to buy it in full. I am aware that wirecast is a wonderful tool and very well developed with multiple options, that is why gameshow was ideal for me because I only offered what I needed with the ideal options. This new program has functions that I will never use, it is like buying an iphone x of hundreds of dollars and, just to use whatsapp,If there is any way to authorize me to buy again gameshow whitout watermark I would appreciate it very much. Vikingo King I'm not sure if they'll make exceptions to the end of sales. I've raised the issue though. Purple Tiger you can try Contact Us on this page and ask.